The latest currency news is that Treasury Secretary Jack Lew is going to put a woman’s face on US currency for the first time. That is good news, of course, and way overdue. But the devil is in the details, and so far the details are not good. I say this as a believer in women’s equality and in modern economics. First, the bill in question is the ten-dollar bill. Why the tenner? Of the four bills we use regularly — the one, five, ten, and twenty — this is the most redundant and the one we see the least of. You need those ones and fives to make change and pay for drinks, and twenties are what come out of the ATM. If you didn’t see a ten spot for a whole month, would you even notice? So it reeks a bit of tokenism to put a woman on our least important of the top four bills. The names that have been mentioned are fine — Harriet Tubman, Eleanor Roosevelt, Sojourner Truth, etc. — but Lew’s suggestion that there might be multiple ten dollar bills, with different women’s faces, seems to compound the tokenism. There’s not one woman in US history who’s important enough to warrant her own bill? The other big problem is that the current occupant of the ten-dollar bill is the perhaps the most deserving American of a spot on our currency: Alexander Hamilton. As one of the authors of The Federalist and then as the first Treasury Secretary, Hamilton consistently advocated for the building blocks of a modern, functioning economy, as opposed to the feudal system of slave agriculture that dominated the South or the “nation of small farmers” that Thomas Jefferson idealized (despite being a rather large slaveholding farmer himself). Hamilton’s was a lonely position at a time when about 90% of the American population lived in rural areas and was engaged in farming. And Jefferson, then as now, was the more popular, inspirational, romantic figure of the two. But Hamilton eventually prevailed, as the nation industrialized and adopted a modern system of banking, including two central banks which finally eventually evolved into the Federal Reserve System in 1913. When a central bank does its job properly, recessions, deflation, and financial panics are less severe. Their track record is far from perfect, to be sure, but that’s a debate for another thread. Jefferson opposed a central bank, as did his fellow Founding Virginian and successor, James Madison, who had the bad timing to let its lease expire just before the War of 1812, when the nation could have really used a central bank. Madison relented after the war and Congress chartered a new central bank, but its lease was allowed to expire in another bit of ill timing, just before the Panic of 1837. Which brings us to that second central bank‘s most implacable opponent: President Andrew Jackson, the face of the twenty-dollar bill. Jackson shared Jefferson’s conviction that a central bank was unconstitutional and wrong. He also blamed the bank for the time he got burned by accepting fraudulent bank notes (currency issued by an individual bank), even though the central bank had perhaps done more than any other institution to keep the banks honest in this respect. The bank had been operating well under its president, Nicholas Biddle, helping to expand credit in line with the growing economy. Jackson began attacking the bank in his first year as president, and made destroying the bank a priority of his reelection campaign in 1832. Upon winning reelection, he ordered his Treasury Secretary (incidentally the same person, Roger Taney, who would later as Chief Justice of the Supreme Court write the Dred Scott decision upholding slavery in the territories) to withdraw the government’s gold and silver deposits in the bank and move them to several “pet banks” around the country. Taney did, basically forcing the bank to call in its chips at other banks, thereby starving them of gold and silver reserves, too, and causing tremendous distress for the banking system as a whole. Surprisingly, this does not seem to have been the main cause of the Panic of 1837, but it certainly did not help. And the ensuing depression, as well as the periodic financial crises and depressions that afflicted the nation for the next seventy-five years, might well have been less severe with a central bank operating as a lender of last resort. 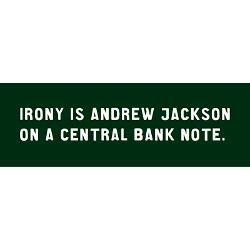 This one works regardless of whether you approve of Jackson’s anti-central bank policies! Why oh why should we be kicking Alexander Hamilton off the ten-dollar bill (or kicking him down to some diminished position on that bill, as has also been suggested), while leaving Andrew Jackson on the twenty? Jackson was opposed to the entire concept of a Federal Reserve, let alone one that was connected to the government’s power to print money. I suppose there are some Jacksonians who like that irony, but it’s hard to imagine that Jackson himself would have been one of them. My proposal, then: Kick Jackson off the twenty, put a woman on. (Harriet Tubman gets my vote.) Keep Hamilton on the ten. This entry was posted on 20 June 2015 at 3:41 pm and is filed under Uncategorized. You can follow any responses to this entry through the RSS 2.0 feed. You can leave a response, or trackback from your own site. Well, if you’re worried about appeasing the racist a-holes who comprise about a third of the national lege, then dumping Jackson is a non-starter. I think that you will be hearing some heads asplode if Harriet Tubman ever gets her likeness on U.S. currency–not that it would be a sound I couldn’t learn to love.